During my quick and short visit to my home province of Mindoro last year (May, 2009), I spotted this poster on a wall inside a restaurant in Calapan City. I don't know who the artist/writer was but I am quite intrigued with his/her use of Hanunoo script. I am not sure if this poster actually is written in the Mangyan language; I can read the script alright, but it only seem like gibberish to me. It does not seem to be written in Tagalog and I don't fully understand Mangyan so I can't truly be sure what it says. Anyway, it's been a year since and I am going back to the Philippines this July 9, 2010 and will be staying until Aug. 28, 2010. I plan to visit the Mangyan Heritage Center in Calapan City sometime during my stay there. Maybe I can ask someone over there to translate this poster to me. Anyway, this poster is one of the inspirations for the new brush-style font. I was also looking at other examples of Hanunóo handwriting (not carving). Like the previous Hanunóo font, I included the pamudpod as well as the cross kudlit or virama. To access the pamudpod use the equal key ( = ) and to access the virama use the plus key ( + ). The Nordenx fonts are created so that a standard western keyboard can easily access the baybayin characters. 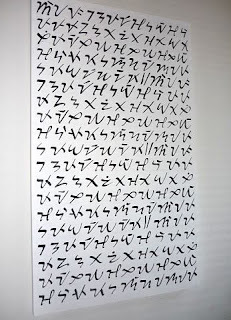 However, please note that the Mangyan script have different kudlit positions depending on what character is used. These different kudlit positions can be accessed by typing the keys for e, i, o, u, 1, 2, 3, 4, 5, and 6 (see sample image in the download page). Using these keys, you can easily and accurately position your kudlits to write the proper Mangyan syllables. To render kudlit in the classical baybayin i/e & o/u locations, just use the i an o keys respectively. 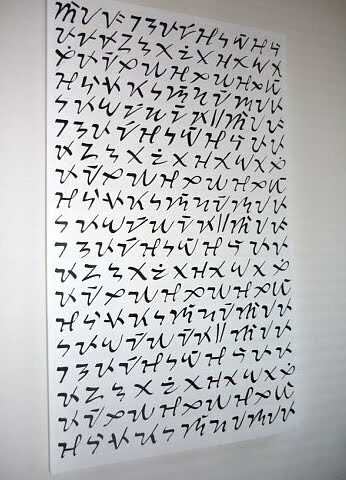 Hanunóo script is used in writing ambāhan - I think it's time to learn how to write these epic poems.